Happy holiday creative friends! Thank you all for joining in the giveaway celebration last week. So grateful for your enthusiasm and for following along. Thanks for sharing your inspiring prompts and celebrating with the creative community! santa's reindeer coupon code giveaway.. Almost all the of coupon codes were redeemed but there are still a few more $10 and $15 coupon codes available until 12/18/14...so go..go..go to wwww.treicdesignsdigitals.com! you can use it on my new art.journal.PLAY LIVE 2015 live stream workshop series. If you are one of the giveaway winners, please email me with your contact information so I can send your prize out to you!! congrats to all the winners and thanks again for participating! p.s. join me for art.journal.PLAY LIVE 2015! digital art journaling/painting, surface design, book binding and lettering. Happy HAPPY holidays to you! Thank you again for following along and sharing your comments and enthusiasm, I'm so grateful to share my creative journey with you. I'm giving away THREE seats to my new 2015 online program!! art.journal.PLAY LIVE is ALL new for 2015!! I created this program to encourage and inspire you to PLAY in your art journal or sketchbook. art.journal.PLAY is a mix of inspiration, creative prompts, LIVE online video demos, Q & A, BONUS google+ hangouts, printable PDF art journaling workbooks, digital kits and online community. art journaling. surface pattern design. mark-making. digital painting. lettering. participate in BONUS google+ hangouts on air and meet other students from around the world! register by 12/31/14 for early bird discount! PLUS when you register you receive printable art journal pages and journaling cards. first 15 people to register receive a limited edition art.journal.PLAY kit. kit includes journaling cards, DIY planner goodies, collage sheets and art journal fodder. The kits will be shipped out in late January 2015.
my NEW art.journal.PLAY community + website launches February 1, 2015! There are still a few more SANTA's reindeer coupon codes left! You can use them on the early bird discount for art.journal.PLAY 2015.
what are your favorite art journaling techniques? #2 ~ Follow me on Instagram @treicdesigns, like and comment on the photo for this giveaway. I'll choose one winner..good luck! comments close 12/15/14 at 11:59pm. thanks for stopping by! Just two more days of giveaways...and today I have a fun online scavenger hunt! I've created coupon codes for you to SAVE $10 - $50 on any of my e-courses. By using the codes some of the workshops end up being FREE! There are only a limited number and once they are used up they won't be available. The coupon codes are hidden within the product descriptions in my shoppe. HINT: the codes start with SANTA's reindeer names :) make sure to click on the tabs to watch the video previews. only one coupon code per person. so if you find more than one, please only use one. cannot be combined with any other coupons. Today I'm giving away one seat in my Printmaking Unleashed LIVE workshop series!! WORKSHOP DESCRIPTION | Printmaking Unleashed LIVE online workshop series combines self-guided HD videos of techniques and projects in Printmaking Unleashed PLUS new content presented during LIVE stream workshops and Q & A sessions. 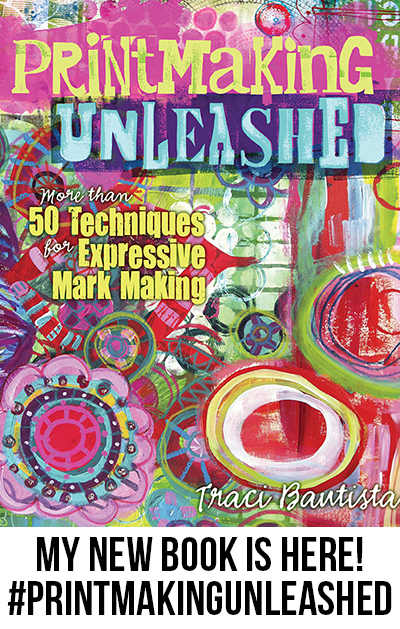 You get an in-depth look at all the materials, mark-making tools and printmaking processes shared in the book. In this video I share a simple background painting technique on Roc-lon Osnaburg fabric then build layers with gesso and ink sprays using one of my handmade floral hot glue stencils. Hey creative friends! Hope you are enjoying your holiday season and thank you for following along my 12 days of giveaways. I'm loving all your creative and insightful comments. I am in the middle of strategic planning for 2015 and am looking to develop new content and e-courses based on your comments and feedback...so thank YOU! 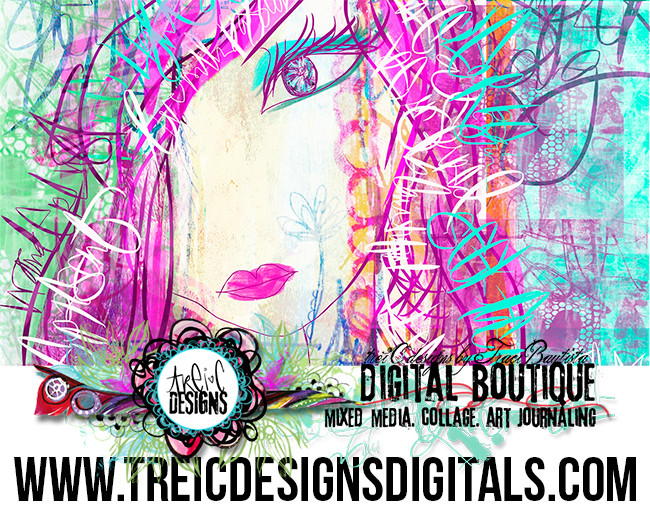 Today's giveaway is a $25 treiCdesigns digitals boutique giftcard. The winner can use it on anything in my shoppe. 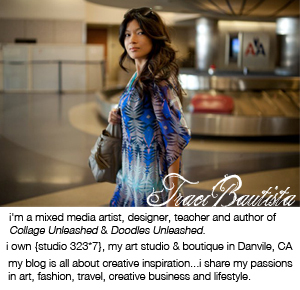 Give the gift of creativity to your artsy loved ones, send an electronic treiCdesigns holiday gift card for my shoppe. HOLIDAY special...ALL orders over $100 from today until 12/14/14, will receive a $10 treiCdesigns giftcard.